On February 6, Elon Musk and SpaceX plan to launch the Falcon Heavy rocket, carrying a Tesla Roadster. An animation that SpaceX uploaded to YouTube on Monday shows the ideal sequence of events, all set to music by David Bowie. Plenty could go wrong or blow up during the launch, but if things work out, there will eventually be a Tesla Roadster in Mars orbit. 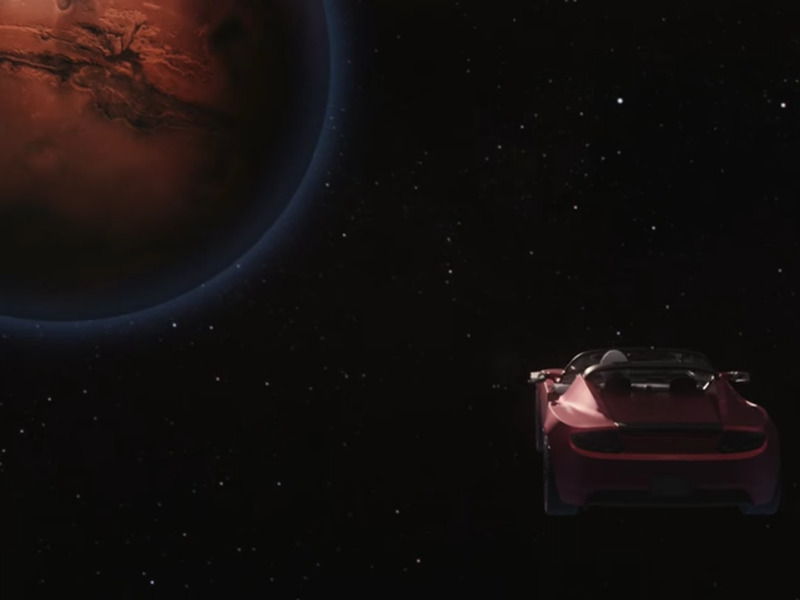 If all goes as planned, there will soon be a midnight cherry “original Tesla Roadster, playing [David Bowie’s] Space Oddity, on a billion year elliptic Mars orbit,” according to Elon Musk. A new animation released by SpaceX shows the ideal sequence of events that the company hopes will come to pass with the launch of its Falcon Heavy rocket. The event is scheduled for February 6, between 1:30 and 4:30 p.m. ET. The video – set to Bowie’s “Life on Mars,” not “Space Oddity” – begins with a gradual zoom in on Earth. The camera makes its way to to the launchpad at NASA’s Kennedy Space Center in Florida, which is the same one Apollo astronauts took off from on their way to the moon. There we see the Falcon Heavy rocket framed with the sun behind it, and get a glimpse of the payload (Musk’s Tesla) sitting in the fairing – the top part of the rocket above the boosters. With ignition comes fire and smoke, then a straight shot through the clouds, where eventually two of the three Falcon 9 boosters separate from the core. Each first-stage booster has nine engines, making for a total of 27 between the three. The boosters then head back toward landing sites on land so they can be refurbished and eventually re-used. The center booster travels farther up, giving the payload more of a push before detaching. SpaceX is planning for that one to land on a cleverly-named drone ship in the Atlantic. Eventually, the Tesla payload – helmed by a dummy wearing a SpaceX spacesuit that Musk has dubbed “Starman” – is released, theoretically into an elliptical orbit that could carry it through space indefinitely. It’s unclear how long the car’s battery could power the soundtrack, however. Lots could go wrong along the way. The launch could be scrubbed or delayed, the rocket could blow up upon ignition, something could cause the trajectory to falter, the boosters may not be successfully landed, or the payload could come free in the wrong way, spinning off into space or burning up in atmosphere instead of entering orbit. But at least we know what Musk and SpaceX team hope to see tomorrow, and it’s pretty cool.